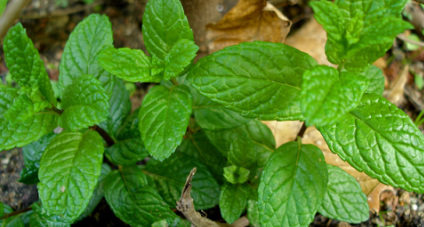 There are over thirty varieties of Mint but the most common are peppermint and spearmint. The delightful fresh taste of mint is often used in desserts and drinks as well as toothpastes, mouthwash and gum. Mint jelly is a common accompaniment for lamb but something I like to do with mint is flavor chocolate. Steep mint leaves in hot milk for five to ten minutes. Strain out the leaves and use the milk to make hot fudge sauce for ice cream sundaes. Another suggestion is to crush mint leaves very finely and stir them into a brownie mix to make mint flavored brownies or just add them to a chocolate cookie recipe. I have a chocolate peppermint plant that is my favorite to use with chocolate, but other mints would work, too. Place mint and peels in heat resistant pitcher or bowl. Add boiling water. Let steep one hour. Strain. Add concentrates and water. Stir well. Chill. Serve over ice, garnish with mint. 3 (12 oz) cans orange flavored sparkling water. Tear mint leaves before measuring. Mix all ingredients except sparkling water and let steep in refrigerator for a few hours. Add orange sparkling water and serve. This refreshing drink would also be good to sooth an upset stomach as both mint and gingers help settle indigestion. This recipe makes 1 gallon of concentrated juice. When mixed with club soda it yields 32 12-ounce servings. Bring the water to a boil in a large nonreactive pot. Add ginger. When the water returns to the boil, reduce the heat and simmer, covered, for 20 minutes. Add the chopped mint leaves, sugar, and honey. Turn the heat down as low as possible and stir to dissolve the sugar. Heat gently for 15 minutes but do not boil. Remove the pan from the heat and let the mixture stand, covered, for several hours. Strain and stir in the lemon juice. Store in the refrigerator. To serve, combine ½ cup concentrate and 1 cup club soda. Soak wheat in cold water for ½ hour. Drain very well. Chop onions, parsley and tomatoes very fine. Add wheat, lemon juice, oil, salt and pepper and mint; mix well. Chill. Toss before serving with fresh lettuce leaves. In addition to tasting great, mint is often used in home remedies. For example, while iced mint tea makes a very refreshing summer drink, hot mint tea soothes an upset stomach. Some people use a concoction of a cup of lukewarm water, a “squeeze” of lemon juice, a pinch of salt and a few mint leaves to soothe the diaphragm irritation that can cause hiccups. Mint is also used to clear sinuses and congestion. Boil mint leaves. After removing the pot from the heat drape a towel over your head and inhale the steam . Other people say this steam is a good addition to a facial to cleanse and open pores. The menthol in mint is also useful for easing sunburn pain. A strong, cool peppermint tea applied to a sunburn cools the skin. Mint is just a great all-around herb to have in your garden (and it smells wonderful when you are weeding)!